Home / Computers and Technology / News / top 5 best smartphone / 5 smartphones which have more RAM than your computer and laptop. 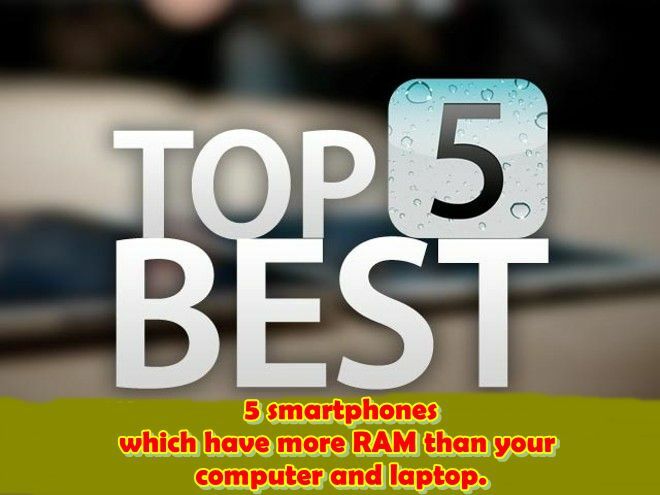 5 smartphones which have more RAM than your computer and laptop. Technology is changing rapidly, now it's a time when the phone is getting more RAM than your computer and laptop. If you are also multitasking and gaming lover and are looking for phones with more RAM, but who do not understand which phone to buy, then today we will inform you people about what kind of smartphones that are 10 Gb is equipped with RAM. With 10 GB RAM you will find onePlus, Xiaomi, Vivo, Nubia brand smartphones. Let us now explain the value of the 10 GB RAM phone and its features in detail. OnePlus 6T McLaren Edition has been launched in India on December 12. This phone of the OnePlus brand comes with 10 GB RAM and 256 GB of storage. For the information of the people, tell us that the sale of this special edition handset will start on the website of e-commerce website Amazon India and OnePlus India from today. In India, the handset costs Rs 50,999. Now talk about the specification of OnePlus 6T McLaren Edition. In addition to the 10Gb RAM and Warp Charge 30 technology, the remaining specifications of OnePlus 6T McLaren Edition are common variants. Dual-SIM OnePlus 6T McLaren Edition will run on the Oxygen OS based on Android 9.0 Pie. It has a 6.41 inch full-HD + (1080x2340 pixels) Amoled display. Its aspect ratio is 19.5: 9. There is a protection of Corning Gorilla Glass 6 on the display. It uses the Octa-Core Qualcomm Snapdragon 845 processor. 10 GB RAM has been given for Jugalbandi. OnePlus 6T McLaren Edition has a dual rear camera setup. The prime sensor is 16 megapixels. This is the Sony IMX519 sensor whose aperture is F / 1.7. With this, the 20 megapixel Sony IMX376K sensor has been given in duo. It also has an aperture F / 1.7. With the rear camera you will be able to shoot 4K videos and also with the Super Slow Motion video. There is also dual-LED flash with rear camera setup. EIS is also available with OIS. Xiaomi launched this October in October this year. Speaking of the features of the smartphone, the device has a Magnetic Sliding Front Camera, Dual Rear Camera Setup, Two Selfie Sensor and Really Unresponsive Display. Xiaomi Mi Mix 3 does not have any display niche, and at the lower part is not too bassy. Xiaomi Mi Mix 3 starts with 3,299 Chinese yuan (about 34,800 rupees). Variants of 6 GB RAM and 128 GB storage are being sold at this price. The variant of 8 GB RAM and 128 GB storage is priced at 3,599 Chinese yuan (around 37,900). The 8 GB RAM and 256 GB storage variants of this handset will be sold for 3,999 Chinese yuan (around Rs 42,100). This phone also has a Palace Museum Special Edition. Its design is unique and it comes with accessories. This variant of 10 GB RAM and 256 GB storage is priced at 4,999 Chinese yuan (about 52,700). There are four cameras in this phone. Two rear cameras are provided with two front cameras. There are two 12 megapixel sensors on the back of the phone. There is a wide angle lens and another telephoto lens. The wide angle lens has a Sony IMX 363 sensor, which is F / 1.8 aperture. The telephoto lens has Samsung S5's 3M3+ sensor. Its aperture is F / 2.4. Other features include dual-LED flash, OIS, optical zoom, AI background music, 960 frames per second slow motion, AI Seen Detection, AI Bokeh, AI Studios and AI Seen Detection. The front panel has a 24-megapixel sensor and the other is a 2-megapixel sensor. These selfies come with light support. The front camera has the AI-equipped buffelation and Bokeh effect feature. The smartphone has a fingerprint sensor on the rear. The battery is of 3850 mAh. The connectivity feature includes dual 4G VoLTE, Wi-Fi 802.11 AC dual-band, Bluetooth 5.0, GPS, NFC and USB Type-C port. ZTE's All Brand Nubia launched the new gaming smartphone Red Magic Mars on November 29. For the information of the people, please tell us that this handset of Nubia brand is an upgrade version of Red Magic. Talking about the important Khasis, this handset is a gaming smartphone that uses liquid and air cooling technology. With the help of this technology, the temperature increases CPU performance by up to 70 percent by reducing the temperature to 13.2 degrees. Now worth the price. The initial price of the Nubia Red Magic MARS smartphone in Chinese market is 2,699 Chinese Yuan (about 27,400 rupees). This price will get 6 GB RAM / 64 GB inbuilt storage. 8 GB RAM / 128 GB storage variant is sold at 3,199 Chinese yuan (about 32,500 rupees) and 10 GB RAM / 256 GB storage variants are sold at 3,999 Chinese yuan (about 40,600 rupees). Now talk about the specification of Nubia Red Magic Mars. The single-sim Nano (Nano) Red Magic Mars runs on Android 9.0 Pie based on Red Magic OS 1.6. The phone has a 6 inch Full HD + (1080x2160 pixels) display with an aspect ratio of 18: 9. 2.8 GHz Qualcomm Snapdragon 845 Octa-Core Processor for Speed and Multitasking. This handset will be available in 6 GB / 8GB and 10 GB RAM options. Now talk camera setup. Nubia Red Magic Mars has a 16 megapixel rear camera, the archers F / 1.8. There will be an 8 megapixel front camera for selfie, the archers are F / 2.0. To save photos, videos and other things, you will find 64 GB, 128 GB and 256 GB inbuilt storage options. Now talk of connectivity. The phone includes WiFi, Bluetooth, GPS, USB Type-C and 3.5mm headphone jack. Ambient light sensor, gyroscope sensor and proximity sensor are part of this phone. For the phone, 3,800 MAH batteries have been given which comes with fast charging support. The length of the phone is 158.25x75x9.85 millimeters and its weight is 193 grams. Xiaomi's supported Black Shark brand launched a new smartphone in October. Black Shark Helo (alias Black Shark 2) Talking about the key features of smartphones, this handset comes with many features related to gaming. Let us know for the information of the people that Black Shark comes in Halo's three RAM variants. It is currently sold in the Chinese market, it has not got any information about bringing it to India. Now talk about the price ofXiaomi Black Shark 2. The starting price of the handset in the Chinese market is 3,199 Chinese yuan (around Rs 34,100). The price is of variants with 6 GB RAM and 128 GB inbuilt storage. On the other hand, you will have to pay 3,499 Chinese yuan (about 37,000 rupees) for the 8 GB RAM + 122 GB storage variant. Premium 10 GB RAM and 256 GB storage variants are priced at 4199 Chinese Yuan (about 44,500 rupees). Now the thing is the specification of Xiaomi Black Shark Helo.XiaomiBlack Shark Halo is a dual sim smartphone. It has a 6.01 inch (1080x2160 pixels) display. Its aspect ratio is 18: 9. Pixel density is 402 pixels per inch. The Adreno 630 GPU is integrated with the Qualcomm Snapdragon 845 processor in the handset. There are three variants of phones based on RAM and storage - 6 GB of RAM / 128 GB storage, 8 GB RAM / 128 GB storage and 10 GB RAM / 256 GB storage. Speaking of camera setup, Xiaomi Black Shark Helo has the old version camera setup only. It comes with dual rear camera setup. Its primary sensor is 12 megapixels and secondary sensor is 20 megapixels. Both sensors are equipped with F / 1.75 aperture and they come with LED flash. The front panel has a 20-megapixel camera with F / 2.2 aperture. Xiaomi Black Shark has a battery of 4000 mAh. It supports Quick Charge 3.0. For connectivity, 4G LTE, Wi-Fi 802.11 A / B / G / N / AC, Bluetooth 5.0, GPS, AGPS, GLONASS, APTX and Aptx HD support. Ambient light sensor, geomagnetic sensor, gravity sensor, gyroscope and proximity sensor are part of this phone. The dimensions of the phone are 160x75.25x8.7 millimeters and weighing 190 grams. The handset maker ViVo launched the Vivo Nex Dual Screen smartphone on December 12. Talk about key features: This phone is the first phone of the company to come up with the Dual Amoled Panel and for the photography it has three rear cameras. Other specifications of the phone are also very premium, such as the Snapdragon 845 processor, 10 GB RAM and 22.5 W Fast Charging. Now the price of Viva Nex Dual Screen is worth the price. In the Chinese market the handset has been launched in 4,998 Chinese yuan (around Rs 52,300). It will be the only variant in the Chinese market, which will come with 10 GB RAM and 128 GB of storage. This information is given on the company's official Weibo account. The phone has been launched in Ice Field Blue and Star Purple color. Whether the smartphone will be launched in India or not, the information is not available at the moment. Now talk about the specifications of Viva Nexus Dual Screen. The Dual Sim Vivo Nex Android 9.0 Pie-based Function runs on OS 4.5. There are two displays in it. The front is 6.39 inches full-HD + (1080x2340 pixels) 19.5: 9 amoled panels. At the same time, there is a 5.49-inch full-HD (1080x1920 pixels) 16: 9 Amolade panel on the rear. The handset has an OCTA-core Qualcomm Snapdragon 845 processor, 10 GB RAM and 128 GB storage. Talking about camera setup, the Vivo Nex Dual Screen has Triple Rear Camera setup on the back side. The primary sensor is 12 megapixels, which is equipped with optical image stabilization and F / 1.79 aperture. It has a 2 megapixel night vision sensor (F / 1.8). The third TOF is 3D stereo camera sensor. There is no sensor on the front panel. For this reason, Face Unlock also works through the backwards camera. From the front side, the in-display fingerprint sensor has been given to unlock the phone. The battery is of 3,500 mAh and it will support 22.5 W of fast charging. Vivo Nex Dual Screen's connectivity features include 4G LTE, dual-band Wi-Fi, Bluetooth, GPS, GLONASS, USB Type-C port and 3.5mm headphone jack. Accelerometer, ambient light sensor, electronic compass, gyroscope and proximity sensor are part of it. The dimensions of the smartphone are 157.19x75.3x8.09 millimeters and the weight is 199.2 grams.